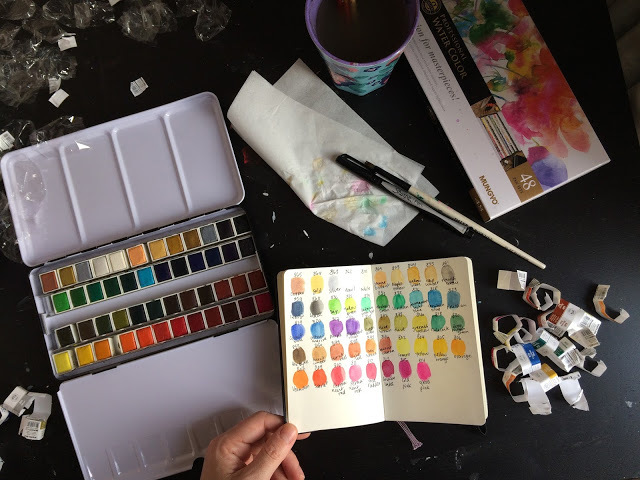 Last week, I found a new (to me) company that makes watercolours: Mungyo. They seem to be a Korean company. I bought a stunning set of 48 half pans. I have been eyeing all the Prima Marketing sets recently (thank you EmK), but they are expensive to have shipped here in Beijing, which takes away from their appeal (i.e. inexpensive sets for the quality). So I thought I’d resist and buy a good quality set here. When I found this set, I was super excited. I shared a photo on Instagram and Lotte requested an unboxing…so here it is! Please excuse my finger pressing the start and end buttons!